The map of Guernsey below shows the location of Guernsey guest houses and hotels. A selection of guest houses in Guernsey are listed below. 44 Hotels, 6 Guest Houses, 3 Cottages, 2 Apartments, 2 Bed and Breakfasts and 1 Inn. St Margaret's Lodge Hotel in St Martins is one of Guernsey's longest established hotels and is located close to the south coast beaches, cliff paths, country lanes and airport, and only 3 miles from St Peter Port - perfect for tourist attractions. All rooms are en-suite and facilities include a gourmet acclaimed restaurant, known by the locals for the delicious dishes, and an outdoor heated swimming pool. Boasting an enviable location by the sea and 2 minutes' drive from Saint Julian's Pier, locally known as North Beach. St Georges is a family-run guest house with free Wi-Fi. Free public parking is nearby. Conveniently located on the seafront near to the centre of St Peter Port. The new marina, island ferries to the neighbouring islands of Herm and Sark and St Peter Port old town are a short walk away. La Michele Hotel is set in the quiet country lanes of St Martins, just a short walk from picturesque Fermain Bay. Awarded 2 stars and a 81 per cent quality rating (one of the highest in Guernsey) by the AA. La Michele Hotel is the only two star hotel in Guernsey to be granted a Silver Award for quality of service by VisitGuernsey. 16 en-suite bedrooms. Superb award winning gardens and heated outdoor swimming pool. Free Wi-Fi. Wayside Cheer Hotel is an ideal family hotel in Guernsey, overlooking the beautiful sandy Grandes Rocques Bay and within walking distance of the popular Cobo Bay. One of the most informal and friendliest Guernsey hotels, the 30 en-suite bedrooms have been recently refurbished. There's an in-house restaurant serving quality meals, a games room, heated outdoor swimming pool in lovely gardens and a large car park. The Dunchoille is located a short walk (15 minutes) from St Peter Port town centre and from the harbour. There are 24 comfortably furnished en-suite bedrooms and friendly staff to make your holiday to Guernsey an enjoyable one. Free Wi-Fi. Beau Sejour Sports and Leisure Centre is five hundred yards away. Candie Gardens & Museum, Castle Cornet and Victor Hugo's home are nearby. Abbey Court hotel is a family run hotel in a quiet residential area and an easy 10 minute walk down the hill to St Peter Port town centre and seafront. The Regency period residence and adjoining cottage have been skilfully adapted to the needs of a modern hotel. Abbey Court can accommodate 51 guests in 23 en-suite bedrooms and 2 single rooms with private facilities. The Forest Park Hotel is located just under a mile from Guernsey airport and 3 miles from St Peter Port with only half a mile from the south coast cliffs with their stunning views and cliff path walks. We have single, double/twin and also family rooms, which are larger and more spacious than our standard rooms. Our suites come fully furnished with a bedroom and a living room. Herm Island is 3 miles from the coast of Guernsey and measures just a mile and a half long and half a mile wide. 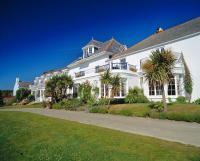 White House Hotel is a 3 star country house hotel with a harbour-side setting and is the only hotel on Herm Island. There are a variety of delightful bedrooms as well as separate cottages for self catering accommodation on Herm Island.